At Focke Meler we work with different types of adhesive applications, including bead and dot, for more accurate application, swirl, to cover a larger surface and save adhesive, and coating, for covering the entire surface. Our two newest applicators are improvements on our coating and swirl solutions, offering different configurations to adapt to your production line. 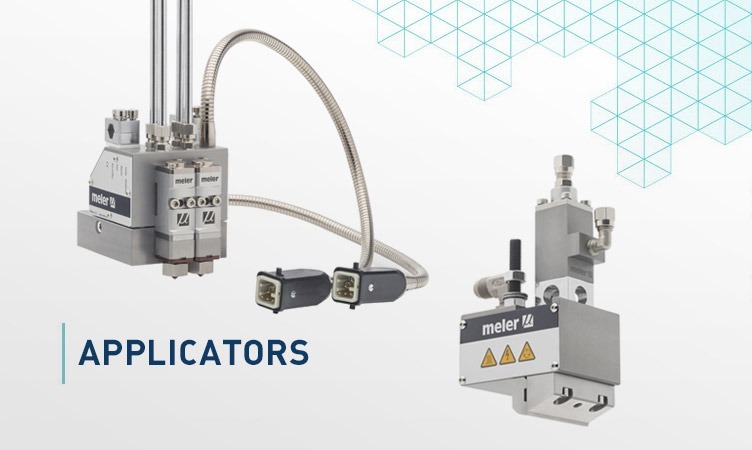 Designed to be able to be used even in the most compact spaces, the size and number of applicator modules can be configured to achieve the range and strokes necessary for each application (with a maximum width of 550 mm). They can adapt to any gluing need across many different industries, such as: packing and labelling, construction, the automotive sector, packaging and sanitary products, among others. Their compact size and lighter weight allow for faster heating, providing thermal stability at every adhesive output and maintaining the swirl air at an ideal temperature for the application. This all translates into greater energy efficiency, and consequently cost savings. Thanks to their reversible nozzle, which allows them to be mounted in the desired position and direction for coating, these applicators adapt to the requirements of your production line. Their size can also be adapted to achieve the necessary range and width. The maximum width is 1000 mm. Their high-speed cut-off system provides a fast and perfectly clean cut-off at the end of the application. Recommended for applications in graphic arts and sanitary products. Another key feature is the easy access to the internal parts of both applicators for maintenance and repairs.